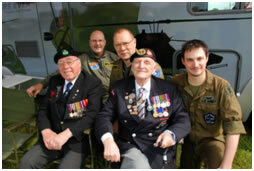 Last summer we had marked the 65th anniversary of D-day. That was an adventure as Bradley and I drove the jeep all the way to Normandy and back, around a thousand miles in a week. Not bad for an old warhorse. 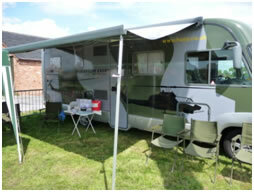 Phil, Jo and Nina travelled down in the motor home and set up camp before Bradley and I arrived. We spent the week driving around the beautiful French countryside visiting key sites of the battle to regain a foothold on European soil. After such a trip we felt it only right that we marked the 65th anniversary of VE Day. Nina and I approached Huntley's at Samlesbury who thought it would be a great event to run. They immediately started to look into a suitable menu for the day and some period entertainment. I also went in search of entertainment with the help of Gerald Jackson of Radio Lancashire who kindly ageed to compere the day. 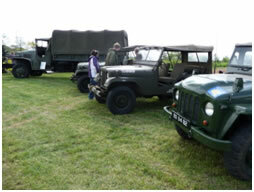 I then set about gathering together a small collection of military vehicles spanning all ages. 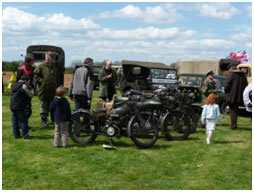 I felt as we have military personnel serving abroad it would be unfair to make it exclusively a WW2 style event. I spoke to Becky to confirm that Phil and 509 weren't committed to appear elsewhere that weekend. So a booking was made. We also contacted local members of the Royal British Legion, Derian House, Support our Soldiers and Arthur Roe of Help for Heroes. 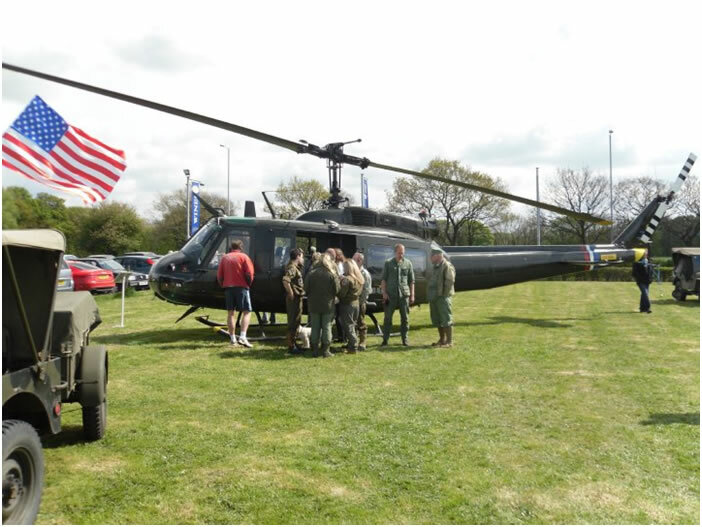 Eddie Cowpe, the owner of Huntleys, agreed that any of the military vehicle owners could camp overnight if they wanted to, helping to keep the owners expense down, as everyone was giving their time for free so as to raise as much for the chosen charities as possible. As always we were monitoring the weather forcast as the day drew closer. Phil and Neil had to do some training the Wednesday before so I decided to have a recce of the oroposed landing site which is already used for helicopter pleasure flights. Nina and I headed down to Huntley's just to sweep the area and clear up anything that could possibly cause a problem on landing. A little later than planned the Huey appeared from the West and made an impressive flyby checking out the lie of the land and wind direction which I was confirming on the ground by standing in the centre of the landing site with my back to it. Neil and Phil then set up their approach from the East to land. Once down Neil stayed at the controls whilst Phil jumper out for a quick chat with Eddie and to have a look around the area to see what his alternative landing site was like. Happy with what he saw he jumped back into 509 and he and Neil took off and headed for home. The following Saturday Nina, Bradley and I were down at Huntleys very early to do a sweep once again of the landing zone and to brief the vehicle owners and to liaise with Huntley's staff about the landing procedure. 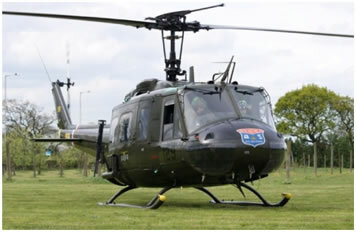 Bradley set off shortly after to Wesham to help Phil get the Huey out and on to the landing strip and then to co-pilot the flight to Huntley's. 509 was put in postion and Phil did his 'A' check of the aircraft. Whilst Phil was doing that everyone was very busy at the receiving end. The car park was cordoned off and everything was made ready for the Huey's arrival. I received the call from Phil to say they were about to lift and so I knew that was our twenty minute warning. All those who were decorating the courtyard with flags and bunting soon stopped work when they heard the arrival of 509 was not far off. As per usual we heard the approach before we could see them, but soon they were spotted heading from the north. 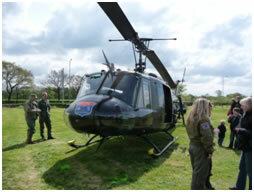 I was talking to the reporter from Radio Lancashire live on air when I spotted the Huey in the distance. 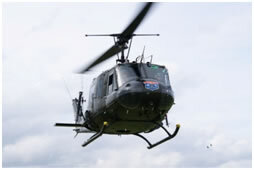 Once I was sure it was the Huey I went back to continue talking to the reporter to explain the process of the reccefly past and the set up for landing. The wind had changed direction and it was blowing from the East so Phil was able to make a straight approach over the open fields to his landing spot. 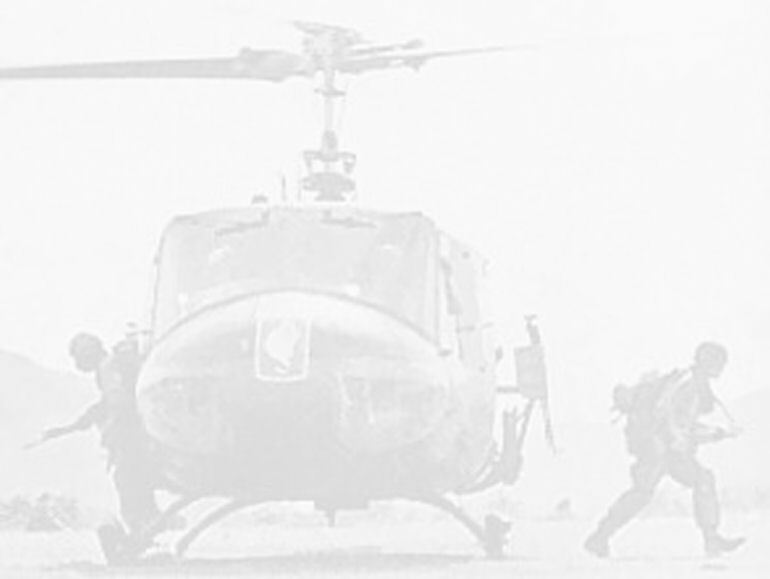 Radio Lancashire delayed their eleven o'clock bulletin to hear the Huey fly overhead. Not many things delay a news bulletin!! Once on the ground and the rotors had been tied down the vehicles moved into postion as did the motor home. We set up our stand whilst talking to the public who had arrived early. Soon everything was in place and we were ready for the day ahead. 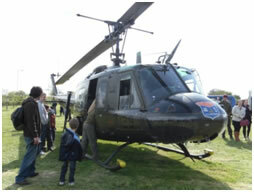 We were inundated with people coming to have a look at the Huey and the other vehicles on site which included Jeeps, a Quad/gun and limber along with selection of military motorbikes plus more besides. Several veterans of WW2 joined us and had a great day having a wander round looking at the vehicles and enjoying the entertainment. Many came back with diffrent shades of lipstick on their cheeks!! 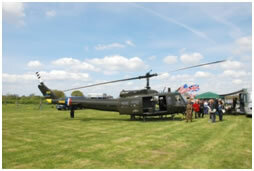 There were also several former military personnel who came along on the day; even a few currently serving. After quite a while we managed to clear the area and 509 was wound up for her return flight. Phil, Jo and Bradley flew back then Bradley brought them back for the evening do. 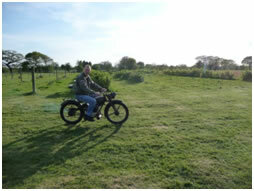 Once again entertainment took on a forties theme with a break for a delicious hotpot supper. a very convivial evening was enjoyed by all who were there. It was a great event marking an important day in history, as well as showing support for our past and present soldiers. A big thanks to all at Huntleys.